We are a community of artists of all disciplines. We aim to provide mutual support, share information, and present a collective voice for the arts in Arlington, MA. To find out more, contact co-organizers Lidia Kenig-Scher and Kimberly Harding at artlinksarlington1@gmail.com or visit us on Facebook. We meet on the 1st Wednesday of the month, from noon to 2:30 in even months and from 6:30 to 9:00 in odd months. We meet in member’s homes & at local art venues, begin with 30 min. for networking around a bagged meal, then have a presentation or a show and tell, and a business meeting. 1. 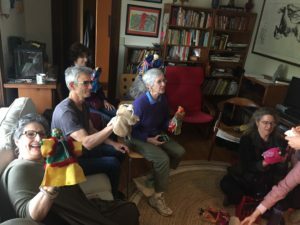 Provide a social connection for artists who live, work or practice in Arlington through monthly meetings and other events. 2. Enhance the artistic and cultural identity of Arlington through exhibits, performances, and participation in community events. 3. Collaborate with municipal agencies, businesses, schools, libraries, and youth organizations to expand opportunities for artists in Arlington to meet the needs of the community. 4. Seek professional development opportunities for artists to support their economic viability and expertise in business practices. 5. Reach out to create collaborative works across different disciplines. 6. Support the establishment of a space dedicated to artists’ needs, including exhibitions, rehearsals, performances, visual arts practice and meetings. 7. Advocate for public funding for the arts. 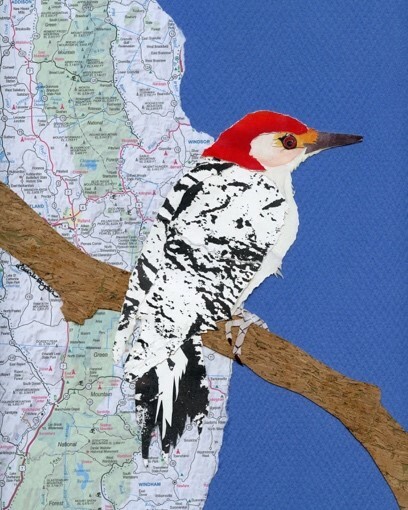 I am a self-taught collage artist. I love to teach and share what I learn with children and adults. I have been a craftsperson and teacher since my teens. 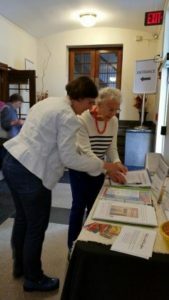 I have shared my ideas in various ways over the years, working with Boston’s “Summerthing” neighborhood crafts mobile, and as the director of a summer camp arts and crafts program. 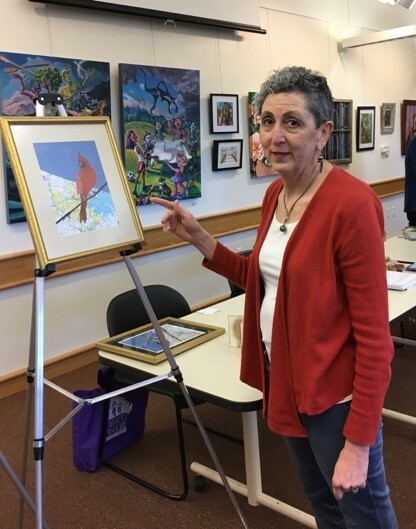 In recent years I’ve enjoyed speaking with artists’ groups and art enthusiasts about my work. My medium of choice gravitated to collage in 2015. 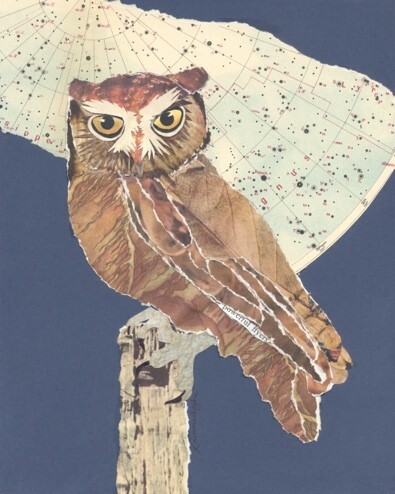 My current work focuses on the owls and song birds of New England. It has always been important to me to use recycled materials. The paper I use gives a new life to vintage book pages and maps that are no longer appreciated. I find myself looking at ordinary images, then seeing color and texture which can be interpreted in a whole new way. 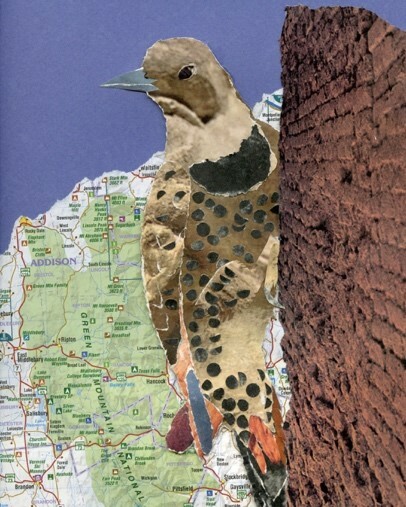 The maps are combined with the birds I create, featuring their natural habitat. Reading a map has become a lost art. We need to think beyond the GPS and have a bird’s eye view of our surroundings. We are losing habitat for the birds we remember seeing and hearing. I hope my work will remind us that we need to pay attention to our surroundings and preserve our natural spaces so our birds, flora and fauna can flourish. 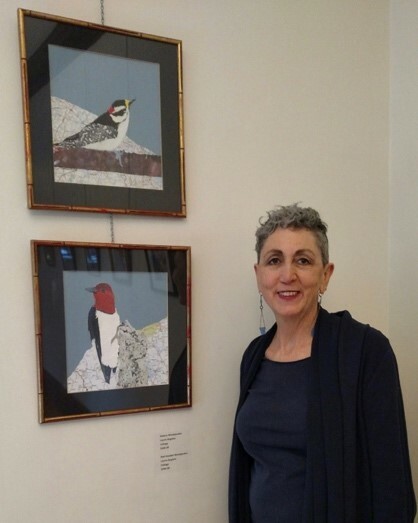 In February 2019, Mass Audubon Habitat in Belmont featured my solo show Navigating Flight. 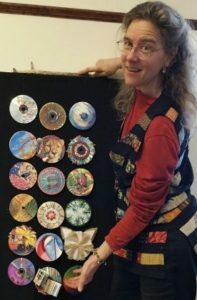 Look for my work in April at Belmont Gallery of Art, The Umbrella in Concord Earth Month exhibit, and throughout the year at local artisan shows and fairs. 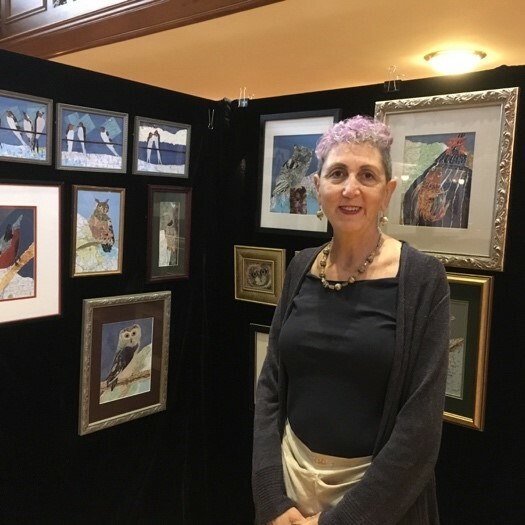 My birds are layered with pattern and color that originate from unexpected images that when combined make the perfect match. Researching habitat, collecting and choosing the perfect map puts on the final touch. I like to combine learning with my art.